The wilderness of New England is a gold mine for hikers, offering an abundance of rolling hills, mountains, jagged coastline, and lakes. Historic trails are well-worn into the landscape, inviting outdoor enthusiasts to undertake epic backpacking adventures or short, satisfying day hikes. This new guide covers the best trails in six states, including jaunts on the Appalachian Trail, the lush hills of Maine, the White Mountains of New Hampshire, the Long Trail in Vermont, the Massachusetts coast, the dense forests of Connecticut, and the wildlife sanctuaries of Rhode Island. Written by a New England native, the book provides measured distances and times for each hike, as well as difficulty ratings, elevation gain, permitting information, and more. "There's a new guidebook out on bookshelves this summer that should interest hikers and backpackers ever in search of adventures. 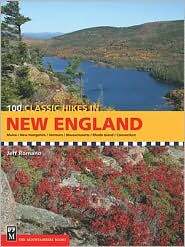 "100 Classic Hikes of New England" describes a wide variety of hiking trails in Maine, New Hampshire, Vermont, Massachusetts, Rhode Island and Connecticut. This tremendous resource details a wealth of hiking locales; some places will be familiar and some not so much." "New England is a hiker’s paradise, yet most guidebooks cover only a single state. That’s one reason why “100 Classic Hikes in New England’’ (Mountaineers) is such a welcome addition. Author Jeff Romano, a native New Englander with 30 years of hiking experience, divides his recommendations between half-day hikes and more challenging routes, addressing the needs of novices as well as experts. Each route is rated for its degree of difficulty, and the round trip distance, variation in elevation, and estimated hiking time is noted. Romano addresses safety issues and lists 10 items hikers should carry on every trip, not one of which is a cellphone." “100 Classic Hikes New England” features 101 full-color Topo! Maps using the new National Geographic map software and promotes year-round hiking on trails in six states. Divided into sections, the book covers Southeastern New England trails like Devils Hopyard, Great Island and Great Blue Hill to hikes in the Berkshires-Taconics, the White Mountains and Camden Hills, Cutler Coast and Sargent Mountain along the Maine Coastline and popular destinations in Northern Maine.